Imagine if the director of The Hangover decided to do a Wolf of Wall Street via way of Goodfellas- but with a couple of gun runners instead of white collar workers..
That, in a nutshell, is War Dogs, the based-on-a-true story tale of Miles Teller's David Packouz and Jonah Hill's Efraim Diveroli. Reunited at a funeral in Miami Beach in 2005, the old friends strike up where they left off with David decrying his desire to leave his personal masseuse job. But he discovers that Efraim's running guns during the Iraq War and exploiting loopholes within US military contracts to his advantage. War Dogs tries to do the anti-hero thing once again, this time hoping for the blue eyes of Miles Teller as Packouz to be our conduit in in this Wolf of War Street tale. And despite the initial energy and semi comedic vibe, the film's wheels fall off as it tries to inject some drama into proceedings, with not enough consideration or fleshing out of the characters to give it the sense of jeopardy it needs. Throwing in a few domestic scenes with Is and David rowing seems to feel enough for Phillips to believe we're invested in David's morally ambiguous ways and his avarice, but the honest truth is it simply doesn't work well enough. And while Teller and Hill work well together, the inevitable downfall and personal split feels lacking in anything emotive. It doesn't help that Phillips has ripped off Goodfellas' voiceover / freeze frame tricks to help sell the necessary exposition or that the movie's clearly been configured around a soundtrack to fit its vibe; there's nothing fresh as War Dogs limps on. It begins to sag viciously towards the final third and even dangerously skirts the line of bland when suspense should have you on the edge of your seats as the denouement dangles more dangerously than Damocles' sword. Fortunately, Hill injects some life into proceedings as the Scarface / Godfather loving Efraim and is a stand-out here. He's a heavy set huckster shyster with a high-pitched giggle whose morals have clearly been snorted in a whirlwind of coke and indifference. Teller's solid too, and while Phillips decides not to justify or moralise their actions too far (save for David's desire to stop being a masseuse), it's not enough to save War Dogs from indifference. A little subtlety and more lightness of directorial touch would have helped immensely, but these seem a little beyond Phillips' grasp unfortunately and elude him throughout. Morally bankrupt can be fertile dramatic territory as every gangster pic and TV show will tell you - but in aiming for lighter fare and ramming home the message to the audience, War Dogs becomes an exercise in endurance as the slump sets in. 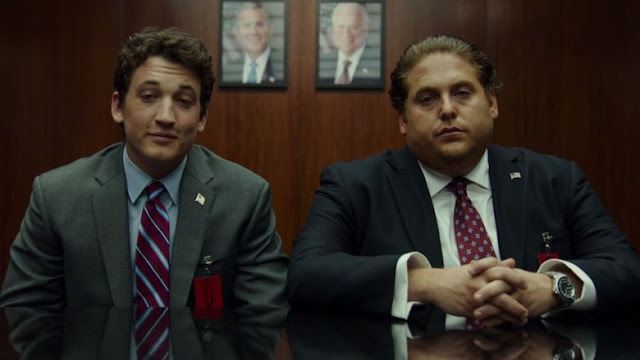 By failing to embrace either the amorality of what's going on or play the comedy darker and with a defter touch, War Dogs may have been held on its leash a little too far and for a story about gunrunners, while it starts strong, it proceeds to stumble on its all guns blazing promise, and once too often, shoots itself in the foot.